We’ve known for a while that Will Smith wasn’t going to be reprising his role as Captain Steven Hiller. But it looks like he’s pretty much the only one not coming back, as Friday brought news that Judd Hirsch and Bill Pullman are the latest in a long line of returning actors. Let’s do a tally: We already had word that Vivica A. Fox will show up as Jasmine, Brent Spiner as Dr. Brakish Okun (which will be quite a feat given what happened to his character in the first film), and Jeff Goldblum’s David Levinson. Add in Judd Hirsch as Julius Levinson and Bill Pullman as President Thomas J. Whitmore, and that’s every adult character from the first movie who didn’t have a major death scene. Except, of course, Will Smith. We do already know that Jessie Usher (Survivor’s Remorse) has been cast as the son of Captain Hiller. We can guess that he’s also the son of Jasmine, and that the two of them will have some sort of exposition-laden conversation explaining what happened to him. Death, I’m betting. Heroic death, presumably, and not a tragic cigar accident, which, let’s be honest, is entirely plausible. All I care about is that, with Pullman confirmed to be returning, that he gets to give another speech. 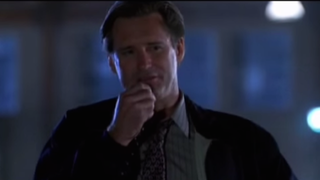 Because, for all the other ridiculous things in Independence Day — the exploding landmarks, the spaceships brought down with a virus, Randy Quaid — Pullman’s speech is the thing we’ve got memorized. How can it be topped? Even better, can someone else try and we just have Pullman in the background giving the biggest eye-roll humanly possible? Or, how about he just gives his original, so-over-the-top-it-loops-back-around-to-amazing speech again? Full disclosure, the author of this post can and will recite this speech from memory whenever the mood takes her.